😉 Nice one, Ken. I did indeed really enjoy this – it’s a period of live shows I really had no knowledge of previously so it was a joy to watch this – thanks again!! The thing about an official release of this tour (or any other archive footage) is that Yes have gone through so many record companies by now that it’s very hard to actually find out who owns the rights let alone who’d invest in a DVD by Yes. Voiceprint is the only hope. The released UNION LIVE. I don’t see Frontiers Records releasing archive material. If it wasn’t released then, I don’t see much hope for anything past the ShowTime DVD of this show (identical to the YT video). Good point, John. 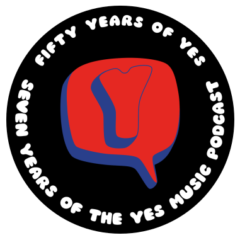 Way back I tried to get official permission to use some Yes music as the theme to the podcast – the record company told me the same thing – it was the publishing rights which got in the way there as well. Thanks, Paul. He’s a busy man and deserves huge credit for his work optimising our experience of this music. Can’t wait for Close to the Edge!